Since 1997, Avalon has partnered with progressive nonprofits and campaigns to raise millions of dollars to achieve their visions. We have helped small organizations grow and leading organizations reach new heights, and we’ve won awards for our groundbreaking work along the way. Allison Porter, Avalon’s co-founder and president, was honored by the Direct Marketing Association of Washington (DMAW) to join its distinguished Hall of Leaders, which recognizes extraordinary contributions to the DMAW and to the direct marketing industry over the course of a career. Our culture of staff engagement and strong benefits earned Avalon an Inc. Magazine Best Workplaces 2017 Award and a Best Places to Work in Greater Washington Award for 2018 by Washington Business Journal. We are proud to be a winner at the National Capital Business Ethics Awards. 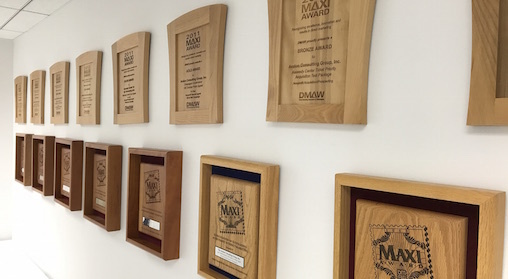 Avalon has won a total of 22 MAXI awards from the DMAW. See below for more details.